From May 25th to the 30th, the Trentini nel Mondo Association held a gathering in Rock Springs, Wyoming for youth ages 18 to 39. Many Trentini settled in Rock Springs to toil in the mine industry. Marina Brun from Lafayette and Greg McGarry from San Francisco participated in the event. Luca Dorigatti of Palo Alto also attended as the US representative to the Trentino Province and the Trentino nel Mondo Association. 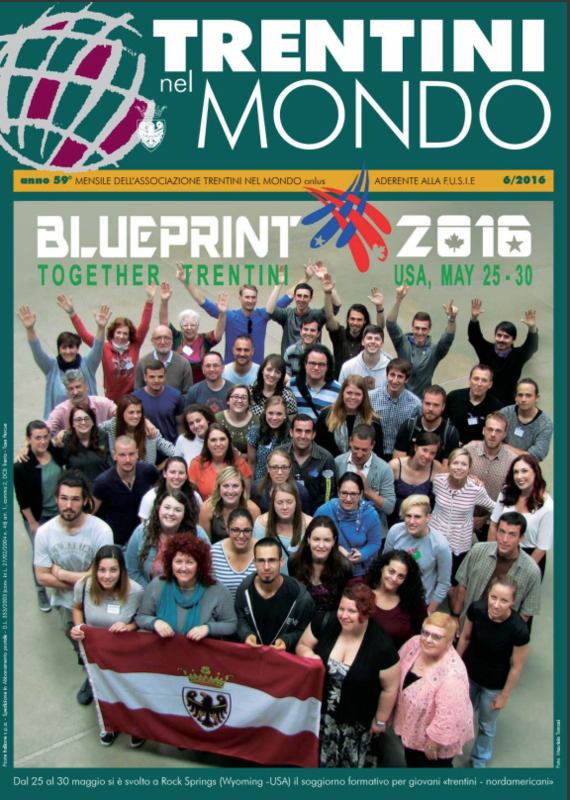 The event was the cover story of the June issue of the Trentini nel Mondo magazine. As a result of this gathering, a website was created, RifugioTrentino.com, and a Facebook page. Although I never got to meet my Trentino grandfather, Eugene, I have always felt a connection to Trentino. My mother made sure to take me there as soon as I was old enough, and I was able to meet my Trentini cousins and fall in love with the small city nestled in amongst the Dolomites. 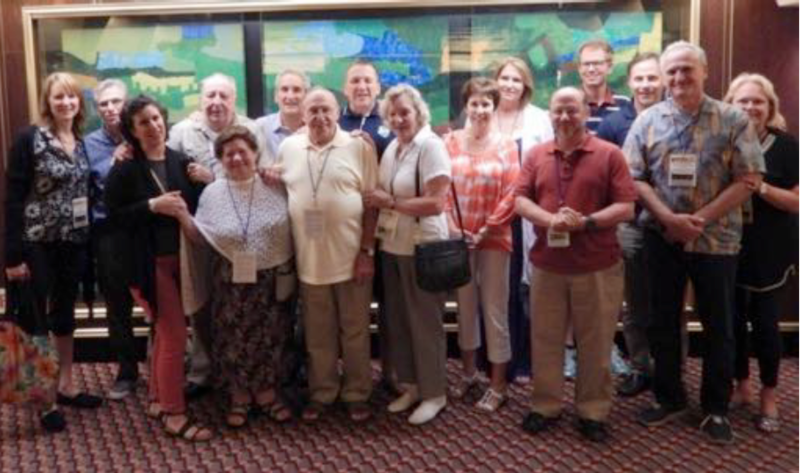 I have not returned to Trento for a couple decades now, but this summer I was able to reconnect with Trentino in a different way, at the Trentino Blueprint 2016 in Rock Springs, Wyoming. 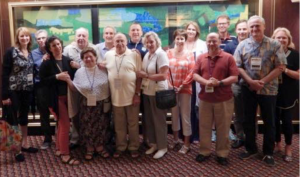 Dozens of Trentini – young and young at heart – from all over North America and Italy converged on the Outlaw Inn (run by a Trentina family for 5 generations) and got to know each other– and our shared history – via workshops, oral histories, presentations, and speeches. It was a wonderful event. We had polenta, dance parties, and late night swims, even making a local watering hole our home away from home (and we dominated Karaoke night!) I was very proud to represent the San Francisco Bay Area and so glad to meet so many wonderful people. Thanks to social media, many of us have stayed in touch. For many of us, it was a reimmersion in the world of all things Trentini, a world I don’t intend on leaving any time soon! Marina Brun lives in Lafayette, California and also attended the Blueprint gathering in Wyoming. Marina is from Brazil and of Trentina origin via her mother. She works for Google, and the company relocated her to California in July 2015. 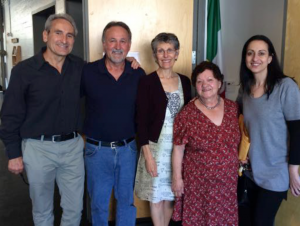 Before that she lived in Ireland for 6 years, and before that she studied for 6 years in Trento through a scholarship provided by the Province. No one in her family spoke Italian, only a few words of dialect passed down from generation to generation. Marina’s mother, Isabel Teresa Piccinini, decided to learn Italian and convinced her to do so as well. 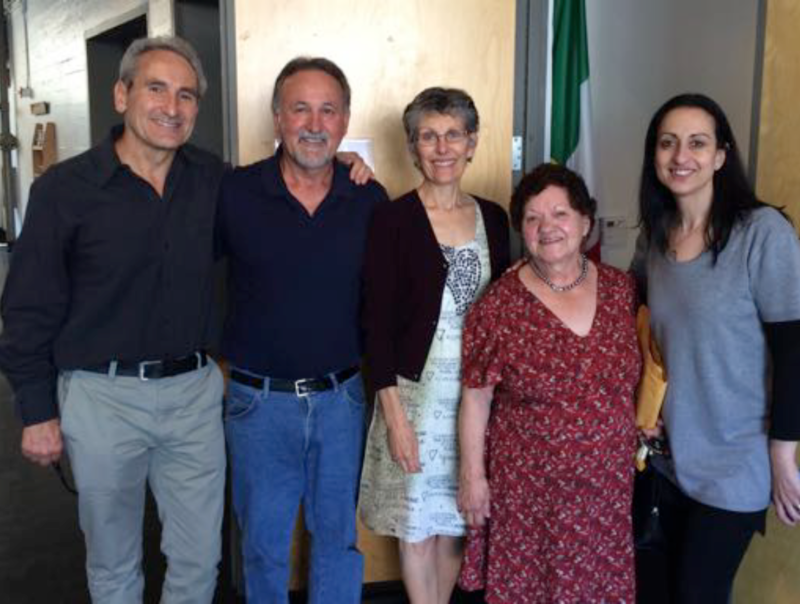 When she applied for the Trentino scholarship, she was already quite fluent in Italian. English came later. Marina’s great-great grandfather, Gioele Piccinini, was from Maso Piccoli, a hamlet of Lavarone, 12 miles southeast of Trento in the Altopiani Cimbri (Cimbrian Plateau). Lavarone, Folgaria and Luserna are the 3 towns that form the Altopiani Cimbri. Cimbrian is the ancient German dialect that most spoke at one in the area. Giselle was born in 1884, one of 14 children. Marina’s family arrived in Brazil at the end of the 1800s, when the country tried to replace slave labor with European immigrants. They settled in Capias do Sul, in Brazil’s southernmost state of Rio Grande do Sul. There Gioele married Clementina Fronchetti, also from Lavarone. They moved about 40 miles west to Santa Tereza, near the heart of Brazil’s renown wine country. Marina’s parents met in Santa Tereza, but she was born and raised about 100 miles further north in Lagoa Vermelha, in the same state of Rio Grande do Sul. There her father, Marino Brun, opened a small business. His Italian family immigrated from Frisanco in the Province of Pordenone, Region of Friuli. There was massive Trentino immigration to Brazil and Argentina. There are more Trentino clubs in those two countries than any others, 60 in Brazil and 57 in Argentina. Compare that to the 21 in the USA and 5 in Canada. There is even a town in Brazil named Nova Trento, New Trento. 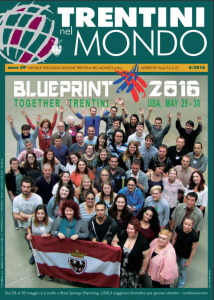 In reference to the Blueprint gathering in Rock Springs, Marina stated: For me being Trentina and my experience in Trento are a big part of who I am. It is very difficult to explain that to anyone else; so it was a great experience to be able to share this time with people who understand and feel the same connection. Our spring gathering was held on April 16th. It was a sold-out event entitled a “Celebration of the Dolomites”, dedicated to the renown Trentino mountain climber, Bruno Detassis (1910-2008). Click here for a video of Bruno Detassis climbing the Dolomites at the age of 82. Consul General Mauro Battocchi, who is also from Trentino, contributed with a testimonial. Detassis’ great niece, Paola Tonelli, coordinated this intriguing presentation. A special Trentino menu was catered by Antonella della Muta. In addition, Roberto Engstrom of Prestige Wine Imports, the distributors of Mezzacorona wine in the US, donated several varietals from Trentino. A special thank you goes out to the Leonardo da Vinci Society for organizing the event, and in particular to President Amelia Antonucci and Paola Tonelli. Also, a special thank you to the Museo Italo- Americano for hosting the event, and in particular to the Museo’s Trentina staff member, Bianca Friundi.